Oppenheimer's recent downgrade of Baidu amounted to nothing more than a regurgitation of news Baidu provided on their earnings call 2 months ago. This oddly timed note is even more perplexing considering the market's recent focus on the potential rapid monetization of dominant utility apps like Google Maps. 'Baidu Core's' entire valuation is now on par with several SAAS 3.0 market darlings with seemingly far less compelling businesses than Baidu's own rapidly growing and already similar-sized cloud business. Oppenheimer's Jason Helfstein Downgraded Baidu's (NASDAQ:BIDU) shares yesterday to market perform from outperform and pulled his price target on the stock (he'd been at $205). While most sell-side calls can amount to noise, this one was notable in that it did grab some headlines. "Baidu's stock falls after downgrade by long-time bull"
Mr. Helfstein has been sitting at an outperform rating on the stock for two years which leads one to conclude that his sudden downgrade was predicated on some notable analytical insight or recent Baidu fundamental business development warranting immediate market attention. We are lowering our rating to and removing our $205 price target as shares are likely range-bound on higher level of spending through the rest of 2019. We now expect BIDU to invest even more in key strategic areas (content, feeds, short video and cloud), which will not benefit revenue until late 2019 or early 2020. We think investments are necessary as China's search market growth is slowing to ~10% y/y and BIDU needs to invest in new growth drivers. While BIDU's core valuation is low, at 10x/8x '19E/'20E EBITDA, with momentum in news feed, short video and cloud, we think the company will see meaningful negative estimate revisions over the next earnings cycle." Now I found this a bit dubious because everything in this note was disclosed by Baidu management on their Feb 21, Q4 earnings call. "Our focus to place greater reliance on organic traffic growth means that we are shifting our financial model to spending upfront marketing dollars with returns spread out over the life of the users. In other words, revenue from channel spend has a delayed effect, whereas revenue from TAC is reported in the quarter of expense. In the first half of 2018, a big part of our marketing expenses were spent on promoting the Baidu App. In the second half, Baidu App seeing strong growth, our app promotion expanded to other products, such as Haokan short video and Quanmin flash video. Our traffic-acquisition mix, shifting from TAC traffic to organic traffic, will dampen our profit margin in the near future, but with extensive internal ROI analysis, we believe over the long term, this will strengthen Baidu's foundation in search and feed, especially with users moving toward super apps and the increase in popularity of mini programs in China." " Some investors may wonder how the economics will work for Baidu, as we enter enterprise AI. Investing in feed and voice assistant are natural extensions of Baidu's search business. As we venture into enterprise AI, we have the potential to leverage the same AI to significantly expand Baidu's total addressable market into the massive enterprise and government sectors. In the case mentioned above, just like the economics of ERP projects, the economics of cloud-enabled AI solutions may have low margins in the beginning, but with each replication, the project margin improves, and our AI solutions become better with machine learning models and experience accumulated." "For 2019 margins, please consider the large marketing campaigns that we did around the Chinese New Year time frame, including branding, red-envelope giveaway and so forth. These forecasts are our current and preliminary view, and are subject to change. I'll now open the call to questions." And Herman, maybe you can help us maybe crystallize the operating income for the core business in 1Q a little bit here. And given the fact that you talked about your priorities are more on organic growth on apps and also you're going to focus on a promotional costs, should we think about maybe a total cost base? How should we think about that relative to 4Q versus 1Q? So for example, in 1Q '18 your total cost base step down about 13% sequentially. Is that the right way to think about it? James, yes, good question on 1Q. So we gave you revenues. With regards to Baidu Core cost of sales and OpEx, the way I would look at it is that in the first quarter, as Robin mentioned, we made a huge promotion around Chinese New Year and a couple of your days ago, on the Yuanxiao, which is the ending of the Chinese New Year, we also did another promotion on television. So we have to consider that cost. So the way I would look at it is when you look at cost of sales plus OpEx, we could be increasing on a sequential basis upwards to maybe RMB 1 billion. Where we decide from that 0 to RMB 1 billion will really depends on several factors, which I think we're going to have to wait for a few more weeks to be more precise because there are some activities that we have to see for it to pan out. But I would say on a sequential basis, you'll probably see a growth, it could be up to CNY 1 billion, or it could be less than that. Suffice to say everything behind this downgrade note was provided by management on the earnings call nearly 2 months ago. So, what's changed since then? Well, Baidu shares have rallied roughly ten percent over the past two weeks bringing them to about 3% above their earnings day close. This is not exactly the type of relative valuation-concerning move typically associated with a downgrade let alone for a notable underperformer in a raging tech tape. What I see here is maybe an opportune time for an analyst whose had an outperform rating on the stock through a near 50% decline to come out and generate some brokerage client trading revenue with a seemingly material note? You can draw your own conclusions on this. Normally I wouldn't even bother commenting on a note like this. It's the equivalent of coming out today and saying Tencent's operating income is going to be weighed down by China's video gaming crackdown. Spot on analysis except the whole investing universe has known that as the shares have climbed 53% over the past five months. So, Baidu at ten percent off its lows and having disclosed all these months ago does not exactly make for a downgrade. In fact, it's almost the definition of a very bad backward-looking analyst call, in my opinion. But, in this case, the timing is so atrocious that it warrants some further commentary. While Oppenheimer was busy downgrading Baidu on two-month-old news yesterday, Bloomberg was doing a story about Google Maps. I mentioned maps as a potential underappreciated Baidu catalyst in my recent article on the name based on the monetization moves I have been following with Google's Maps product. It seems these developments are now filtering into the mainstream financial news. Sometimes I say the most under-monetized asset that I cover is Google Maps," Brian Nowak, an analyst at Morgan Stanley, said while interviewing Google's business chief Philipp Schindler at a recent conference. "It's almost like a utility where it's kind of waiting for you to flip the switch on." Schindler's response showed that Google isn't waiting anymore. He sliced the opportunity in four areas. Basic directions are a "utility" that can't be messed with much. Second are requests for things nearby; followed by broader, personalized recommendations; and finally searching neighborhood business listings. If you think about Maps monetization from those four different angles -- a little bit more caution obviously on the first one, not disrupting the utility aspect and all the other three -- I think it's a really, really interesting playground going forward," Schindler said. This is notable in that Google is discussing consumer-facing monetization which frankly they have been quiet on up until now. My interest in Google Maps has been on the API backend where they made some moves last year to ramp up monetization, and interestingly enough this article touches on the very same story that caught my attention last year. Last Summer, a Polish startup that helps people find their medication at brick-and-mortar pharmacies by leveraging Google's API published a blog post explaining why they would no longer be able to use the API. Now you may be wondering why highlight Google losing a customer to a smaller startup is somehow a positive read-through for Baidu Maps. The answer is simple. Google was making no money off this startup, and still incurring costs for their best in class map service. By implementing a broad price change and making the maps API now a private key that requires a credit card, they are in effect rationalizing their more than decade long investment. 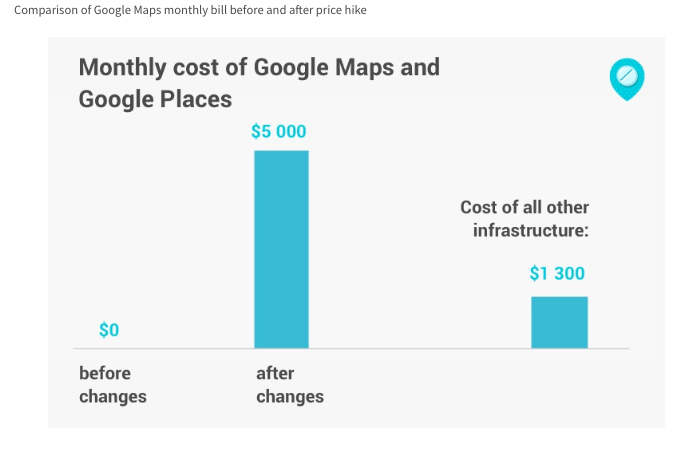 This customer now has to find a smaller mapping startup which while not as expensive as Google will still cost money. This enables Google to ramp monetization off of startups/service providers who have a viable location-based business model and improve profitability by getting rid of the dead weight. This also makes competing with Google at scale with the lead they have here all the more difficult. Anyone not paying attention to the investment implications of moves like this should simply look at the 26% decline Tom Tom shares suffered last September on the back of Google announcing that Mitsubishi, Nissan, and Renault had selected them as a maps partner. Now you'd think analysts evaluating Baidu's stock investment prospects would be attuned to these types of move out of Google, and draw some conclusions about what monetization switches Baidu can flip on if need be. Sure, Baidu faces competition in maps from Alibaba in China, but nobody in China can bring the integrated stack they have to this space. Baidu's autonomous driving platform Apollo is already used by 130 automotive and technology companies globally. In the last quarter, Baidu's DuerOS passed 200 million device installs while logging 1.6 billion voice queries. 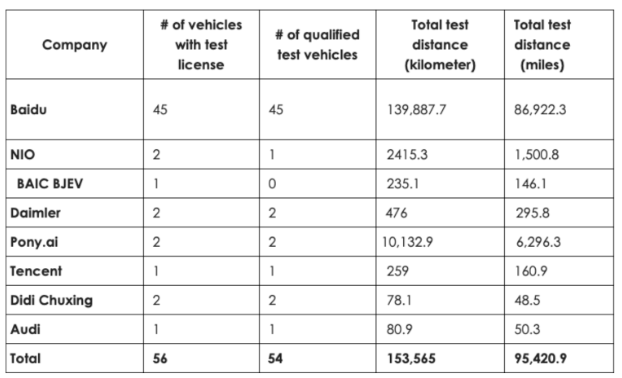 Two weeks ago Beijing's transportation regulators issued a report on the city's autonomous road testing projects. Baidu's Cloud unit reported $165 million in revenue last quarter more than doubling yr/yr. To put that in perspective, Twilio clocked in at $204 million and was up 77% yr/yr. Baidu Cloud is seeing strong growth in both revenue and customer base, and is expanding AI solutions across different industry verticals, such as telecom, manufacturing, financial services and transportation. For example, last quarter, we showcased a top telecom operator in China that used Baidu AI solution to power one of their call centers. After initial implementation, Baidu AI solution was handling millions of calls per month, and reducing the average customer call time by over 70%. We recently signed with the telecom customer to expand Baidu AI-powered automated call center solution to power several more call centers. At the same time, we are receiving interest from financial institutions as well as airlines to power their customer call centers." I assure you Baidu Cloud is not a 50% gross margin business, but yet at 5% of Baidu Core current revenue and growing at triple digits it seems to be valued at nothing. Ironic when you consider Twilio's communications cloud biz is roughly the same size and worth nearly 1/3 of all of Baidu. What would Twilio's market cap be if Flex was powered by the leading AI natural language processing and speech recognition technology vs having to be one of countless vendors now integrating with Google's solution here? Whose tech would you rather bet on long-term in the call center, the search giants AI-powered developing offerings or one of dozens of cloud contact center solution now targeting legacy vendors? I know my answer to this question. However, despite clear evidence of returns on these early long-term investments, Baidu continues to be treated like they are some dying Chinese portal making risky all or nothing investments vs. a cutting- edge tech hyperscale giant with a shrewd allocation strategy. In my recent Baidu article, I pointed out how I was not a fan of them chasing the short form video market. But it's not like management didn't clearly address their views on this topic on the recent call…. Yes, Grace, with regards to the financial model, you're going to probably see these video apps following the same trajectory that we saw for the Baidu Apps. So in the beginning, we're going to have to acquire content for these apps. And then more importantly, we're going to have to spend promotions to grow the users. And how much we spent on promotion really depends on the daily analysis that we have on the ROIs, whether each of the inventory spot is getting that good ROI. If we do see it then, we're going to continue to double down. If ROIs are not good, users are not staying on the apps after they come in, then with that inventory channel, then we will cut off. So it's really a function of if we can grow the users and grow users' stickiness." Baidu managed to report a $2bl+ operating profit last year while is essentially incubating a Netflix, Waymo, Alexa, Bytedance, and battling China's other tech giants over ad dollars. They also managed to only trail Google in VC AI investments and launched their own AI chips. They also spun off their global ad and tool business, sold a majority stake in their financial services arm, and exited the food delivery business. All the while they have maintained gross cash per share equal to roughly a third of the current stock price. They can do this because Search remains such an attractive and profitable business, and not because it is some sort of Achilles' heel. There is no doubt Baidu faces tough competition in China. But investing is about risk/reward. If Baidu succeeds at what they are doing, the stock has 5x long-term upside from here. What's the downside right now? Would you rather own a 'Baidu Core' which can afford to subsidize all these investments or a Twilio or Lyft at the same valuation? This analysts downgrade implies the stock should go nowhere, and then suddenly rerate 50% upward once a lever has been pulled. Good luck timing that. The trick to a stock like this is seeing the levers to pull are patently obvious already, and that literally there is no reason to pull them yet. I also think Baidu's strategic options are being vastly underestimated by the market. China's at a point were certain battlegrounds have been drawn, and Baidu's suitability as a partner/target for the likes of upcoming Bytedance and even Tencent should not be discounted. Baidu is the type of company that actually stands to get stronger in a down tech cycle, and is thus an appealing partner/target if it remains as unloved by Wall Street as it currently is. Disclosure: I am/we are long BIDU.